I've been taking some time to check in with Mayfair's most beautiful luxury jewellery brands. It recently dawned on me that although I must certainly pay homage to the jewellery and timepieces that are so excellently and expertly crafted, interiors within certain stores are also deserving of praise and recognition. When discussing a jewellery or watch investment, the interior of the store can very much make or break the in-store experience. Although it first appears as though de GRISOGONO should always have existed in London's Mayfair, the flagship store did not appear on New Bond Street until 5th February 2016. Located at number 15a and spanning 85 square meters, the beautiful store features an interiors concept developed by de GRISOGONO founder Fawaz Gruosi in collaboration with London interior architecture practice David Collins Studio. The store concept expresses the energy, craftsmanship and detailing of the jewellery and watch collections designed by Fawaz Gruosi, utilising classic details and proportions juxtaposed with modernist furniture pieces. 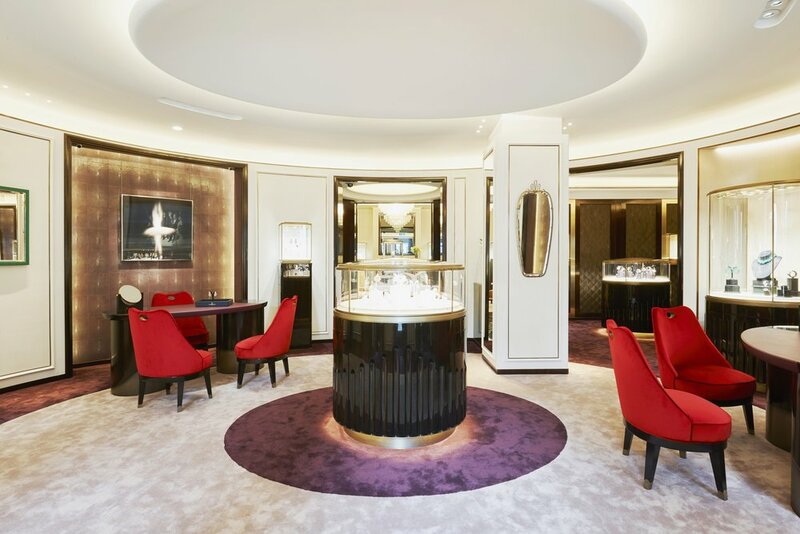 The stunning interior design subtly references the aesthetic constants of the iconic de GRISOGONO jewellery within the interior architecture and furniture. The elegant wrapped metal framing that features throughout the store and connects the interior with the jewellery is based upon the iconic interlaced Allegra jewellery collection. Fawaz Gruosi has personally curated artwork from the Opera Gallery by André Brasilier and Umberto Ciceri and two gold La Murina, Murano glass chandeliers, each one metre in diameter, and a selection of mid-century Italian furniture. In 1993, Gruosi founded de GRISOGONO. Driven by a perpetual quest for beauty and excellence, this natural born creative and man of impeccable taste shapes daring ideas with immense talent. Creative director of the Maison, Fawaz Gruosi is passionate about exploring unusual materials and exceptional stones. 23 years after propelling the black diamond to the forefront of the international jewellery scene, Fawaz Gruosi is today regarded as one of the most innovative creative forces of his generation. His bold, iconic designs have enabled de GRISOGONO to carve out a place for itself amongst the most prestigious names in contemporary luxury.